These nick names all came from Orangie's personality. He very much had a "cat's rule" attitude about him. There was never a dull moment around him; his personality and intelligence grew on you -- you could not help loving this crazy kitty! He was a lot of fun, very intelligent, and a loving member of the family. He was our first baby who never really grew up. Even as a baby Orangie always purred very loudly. He was very sweet and affectionate, if he wanted to be, and he was easy to get purring. 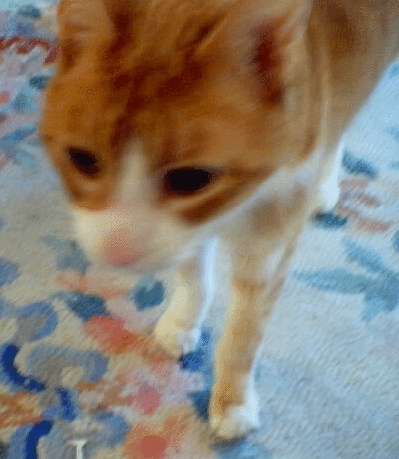 As a kitten, Orangie's ears were way too big for his face; whenever he would shake, his ears would always make a loud flopping noise. Even as an adult, Orangie had big ears! 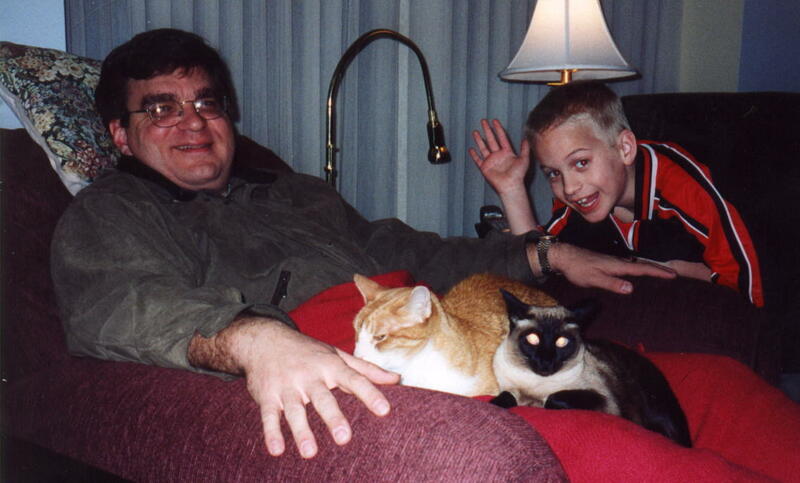 When we would go to bed at night we had to close him into the basement; if we didn't: at 2:00 in the morning he would come into the bedroom and meow very loudly and wake us up out of a sound sleep -- a nightmare! In our first house we had to close and lock the bedroom door to keep him out - "putting the people to bed!" When we moved to the new house, we quickly learned that closing Orangie in the basement was not enough; Orangie was tall enough to open the doors himself. We had to change the door handles to the basement and garage from a handle to a knob. For all other doors in the house, Orangie would, at will, pull down the handle to let himself into any closed room -- including a bathroom!! 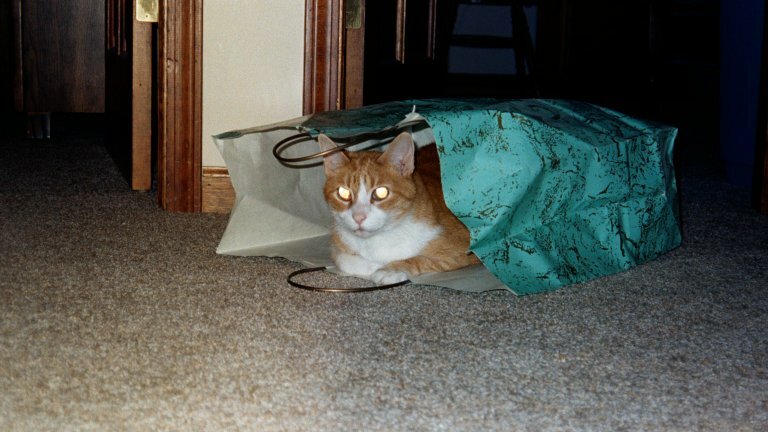 In our first house in Wheaton, Orangie would "skitts." That is, he would dart around the house almost bouncing off the walls. He gained a habit of running to the top of the stairs and "hugging" the pedestal at the top of the stairs. Orangie never really grew up; I can remember him skitts-ing as late as Christmas 2000. Jokingly we would call him a KitTEN or OrEEEEnge when he got into playful trouble. Every Christmas, he would hide behind the Christmas tree, like a jungle kitty, and occasionally pounce on an ornament. He broke several; his favorite ornament was a bell -- he would stand on his hind legs and bat a bell and make noise until he would get our attention. I am not sure where he learned this, but Orangie had a bad habit of knocking things off of the kitchen counter whenever it was close to dinner time. He was doing this up to his last days. Sometimes he would knock full glasses of water off the counter making a very big mess. Of course we would reward him by feeding him -- we would get up to feed him and a big "thud" would be heard as he jumped off the counter to his food dish -- a curse of "... you rotten lousy cat..." did no good. It was a viscous cycle! He out smarted us all the time. 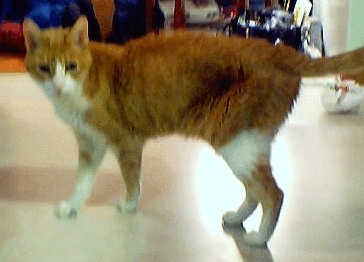 When we converted the living room into the adult TV room, Orangie learned that by walking on the Piano keys, we would get so annoyed that we would get up and feed him. A smart kitty with a musical touch. Free feeding Orangie stopped when he was a Kitten. He would eat like a horse (he eventually got up to 16 pounds! ); so we had a routine of feeding him once in the morning and once at night. For years, we would feed him at 8:00 (he always knew exactly when feeding time was!!). Then when we went to bed, he tried to out smart us: right when we turned off the TV, Orangie would dash to a hiding spot, usually behind the TV or under a table; someplace that was very hard for us to reach. Sometimes, we would have to ignore him and try to trick him to come out -- there was no way we were going to bed without Mr. Nightmare Kitty in the basement. Eventually, we learned that we had to feed Orangie in the basement. This hide and go seek routine was very difficult -- Orangie always outsmarted us!! Sunday was treat day. 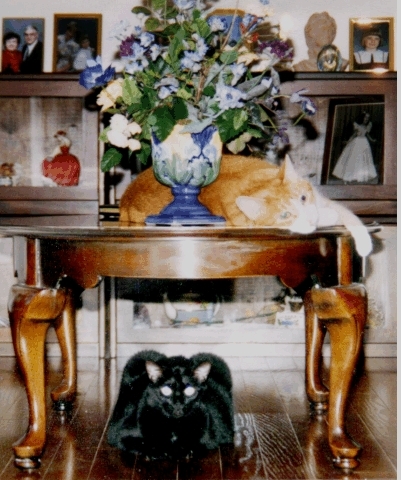 For years, every Sunday we would split a can of Fancy Feast between Orangie and Blackers. Orangie was amazing; he knew when it was Sunday and when he saw us walking by the cabinet he would start begging -- but only on Sundays! He was amazingly tall; when standing on his hind legs, he could stretch all the way up to the counter top. Later, as Orangie started having digestion problems, Fancy Feast was the only food that he could easily digest; as he got older, as usual, he got what he wanted. We used to give Orangie and Blackers Pounce. It is a little kitty treat. We originally used Pounce as a bribe to get the cats to do tricks. Blackers was very agile and she could always catch the treat; Orangie was klutzy, he was not always able to catch the treat. 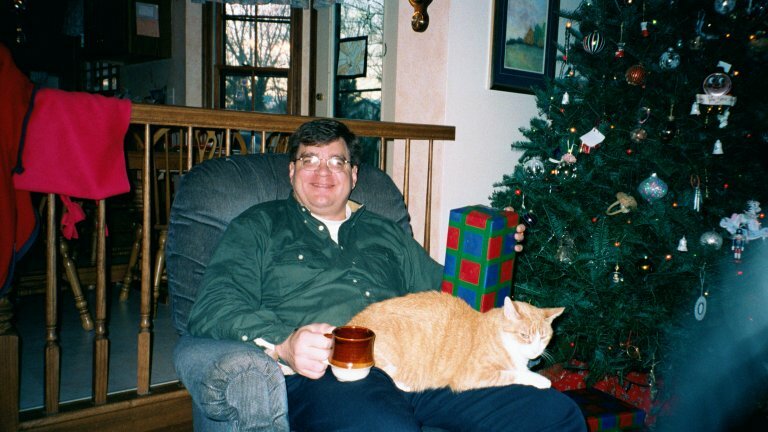 Later on, Pounce was the treat my Father gave Orangie whenever he visited. Orangie was usually indifferent to visitors. But when Dad visited, Orangie would run to meet him and expected (and always got!) a generous portion of Pounce. Either by accident or skill as pet owners, we were able to train Orangie to come like a puppy dog. We would call "kit-kit-kitty!" a couple of times and Orangie would come running. Of course, he was expecting to get food, but sometimes we just wanted to know where he was. The photo with Orangie and Blackers together is cute. 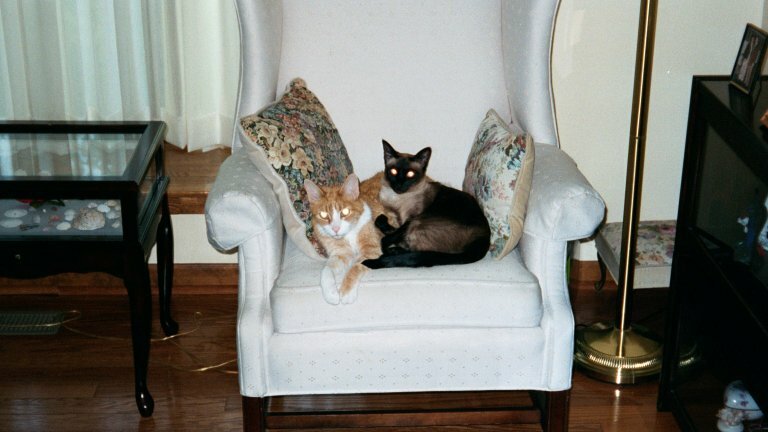 Blackers was sweet and shy; Orangie was an out-going klutzy bruiser. Orangie liked to lay on his side on the living room table. He would rollover and knock this flower arrangement off of the table. Eventually, the pot was broken and we used Tupperware as the pot to hold the plant. Further, we took the plant off the table; it was Orangie's table top and the people were not allowed to put plants on it. Blackers would never cause such trouble. For years, Orangie was keenly aware of the nature outdoors. He would run from window to window to check out a ground squirrel or he had a wicked yowl whenever a strange outside cat would come to the window. A couple of times Orangie would be nose-to-nose (through the patio door) with a raccoon or possum. 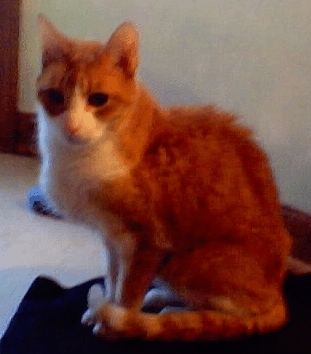 Orangie was a people kitty. Wherever the people were, Orangie was near by. Whenever we came home, he would greet us at the door. During the afternoon, Orangie would snuggle with the people: either sit on our laps or lean up against a pillow near us. In the evening, when the "tension" of getting feed was building, Orangie would sit on the headrest part of the couch in the family room -- a head-pillow kitty. His station was behind Cathie's spot on the couch, right next to a warm reading lamp. There were times when Orangie would put his paw on Cathie's head or face and pull, trying to get her to feed him. If you tried to pet Orangie while on the headrest of the couch, you would sometimes touch is belly area; he was very ticklish and he would snap at you. Never bite, just try to nip at you. We would affectionately refer to Orangie as a "Snapping Turtle." As a people kitty, Orangie had a way of being in your face -- "... notice me! I am the kitty of the house!" This was most common when he would jump up on the kitchen table and lay down on the newspaper, especially the part of the paper that you were trying to read. Also, when you were using the computer, he would jump up on the desk and walk across the computer keyboard; sometimes causing you to lose work. In the study, Orangie would beg to crawl into the file drawer. I would open the drawer and Orangie would climb into the back of the drawer. He would sit there, very happy and content in his little secret kitty storage area. If the family was out for the evening, we would be greeted by Orangie in the window when we came home. He would look out the living room window, messing up the curtains, looking for our car to turn-up the driveway. When he saw our lights he would jump out of the window and run to the garage door and meet us. Did Orangie miss us? Or, was he concerned about being feed? Well, either way the people felt missed and it was nice having a loving kitty meet us at the door. Everything changed for Orangie when we had Liz and Mike. At first you could tell that Orangie pretended that they did not exist. As the kids grew up, they reached a rowdy and playful age, Orangie would sometimes freak-out and seek a hideout. One funny time, the kids were playing rough, and Orangie hid, just out of reach, under Michael's crib in his bedroom. Orangie was visibly shaken and you could tell that he did not feel like the dominant creature of the house any more. Much later in life, Orangie grew to love the kids. Orangie learned to get Liz to feed him. If the adults did not feed him, Orangie would go to Liz's (sometimes dark) bedroom and would knock stuff off of Liz's dresser; annoyed and sleepless, Liz would go downstairs and feed Orangie; again, he always got what he wanted. Orangie learned to sit on the kids laps and become quite cuddly with them. 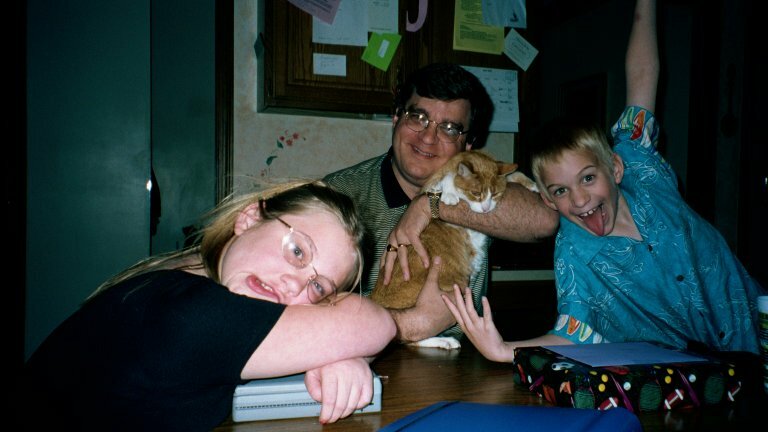 Mike was a very rowdy kid, but with Orangie, he was always very soft and loving. After Blackers died, Orangie moped around, not very active. A few months later, we adopted Chocolate Kitty. She is a Siamese kitty who is very high strung and rowdy. She very definitely perked-up Orangie. Chocolate would try to bite Orangie's ankles; Orangie would turn around and slap her -- landing flat on her back. Chocolate would pick a fight and they immediately fall, belly-up, into a submissive position. They would chase each other around the house like herd animals. All the way up to his last days, Orangie was asserting his Alpha dominance on Chocolate. After Chocolate grew up a little, Orangie and Chocolate would snuggle together and sometimes groom each other. In the morning, Chocolate would wait outside the basement door, for us to feed Orangie; sometimes, she would stick her paw under the door to try to help Orangie get out. I really think Chocolate was good for Orangie's physical and mental(?) health! Some of the nicknames that I have not covered: Bruiser, Bulldozer, and Rotten Lousy were names used when he would knock over something, usually on purpose to get fed. Puff was our name for him when he sat on the floor in a scrunched-up puff ball position. Throw-rug kitty was what we called him when he lied down in the middle of the floor on his side; sometimes, when he would block the entry way, we would fake wiping our feet on him and call him a throw rug. 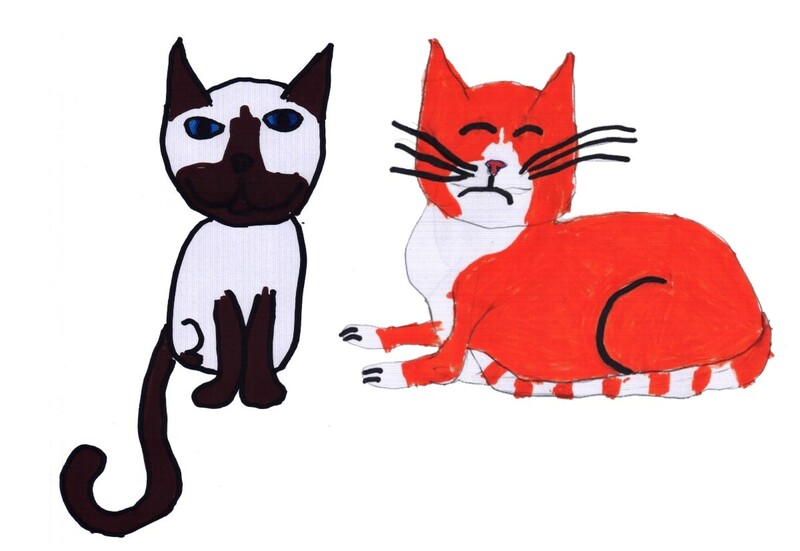 Kitty-Witty, Puddy-Woody, Kitten-Witten and Mr Kitty were affectionate names we would call him especially later in life as we were caring for him; these pet names really fit his personality! When the Power Rangers came out, each ranger had a color (Pink Ranger, Red Ranger, etc); for awhile we called Orangie, of course, the Orange Ranger.